Mabelle Birrell Finger, age 91, of Bethel, CT, died Saturday, May 12, 2018 at the Saint John Paul II Center, Danbury, CT. She was the wife of Clyde M. Finger, Jr., married in 1947, having celebrated their 70th wedding anniversary last November. Clyde and Mabelle lived all their lives in Bethel and Southbury. She was born in San Antonio, Texas on March 9, 1927, daughter of the late William Birrell, Jr. and Bertha L. Birrell, who was visiting that area at the time of Mabelle’s birth. Known to all her friends as “Sugar,’ that was a lifelong nickname acquired during that very brief stay in Texas. 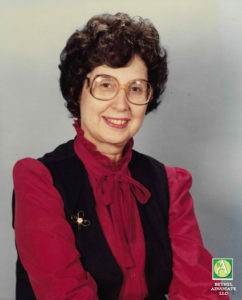 In addition to her husband, Clyde, she is survived by her cherished family: Clyde W. and special friend Margaret Ricker of Oxford, CT; Stephen (Debra McKinney) of LaVale, MD; Joy (Richard Wood) of Cottage Grove, WI; and Robert (Ana Maria) of Weston, FL, seven grandchildren and three great grandchildren. Mabelle graduated from Bethel High School Class of 1944, graduated from Green Mountain College in Poultney, Vermont in 1946, and attended Traphagen School of Fashion in Manhattan, New York. While raising a family in the homestead built by her grandfather, William Birrell, Sr., she took part in the operation of William Birrell, Jr. and Company, a hatting industry back shop that produced templates, patterns and wood and aluminum components for hat factories around Danbury. She started a career as the Office Manager for the Bethel Planning and Zoning Office in 1972 and retired in 1997 after 25 years. Mabelle was passionate about designing and sewing clothing and was well known as a source of help to anyone trying to sew; working at the Remnant Outlet in Bethel for several years. Sugar and Clyde enjoyed a large circle of friends in the Bethel area; many associated with the Bethel Volunteer Fire Department and the New England Family Campers Association. She enjoyed traveling and visiting with her large extended family, with brother and sisters-in-laws and their families that spread from Connecticut to Maine, Florida, Arizona, and California. Most of all she enjoyed raising her family and the joy of being present in the lives of her grandchildren and great grandchildren. God bless the precious caregivers at Saint John Paul II Center, The Gardens Assisted Living, Danbury, and Seasons Hospice and Palliative Care. They are truly angels of love. In lieu of flowers, donations can be made in her memory to Seasons Hospice Foundation, Inc., 6400 Shafer Ct. Suite 700, Rosemont, IL 60018 or a charity of your choice. Friends and acquaintances are invited to a memorial service celebrating the life of Mabelle at 10:00 am on Thursday, May 24, 2018, at the Bethel Funeral Home, 215 Greenwood Ave., Bethel, CT with Pastor John Esposito of the Bethel United Methodist Church officiating. Internment of the ashes will follow at Elmwood Cemetery, Dodgingtown RD, Bethel, immediately afterward. Friends are all invited to the Bethel Vol. Fire Dept. Hall South St., for fellowship and light fare following internment.